The 6000 grades of aluminium are also known as the magnesium and silicon grades; these two alloys are the main alloying constituents in all 6000 grades and specifications of aluminium. The 3 most common grades in this category are 6082, 6063 & 6061. Grade 6082 is the most common grade of commercial aluminium sections & plates, and T6 is the most common temper. 6082T6 is the strongest of the 6000 grade alloys, which is particularly suitable for structural applications and also for welding & machining. Grade 6082T6 is also often simply referred to as T6 Aluminium. 6082T6 aluminium has good corrosion resistance. It is suitable for outdoor applications, and it will not rust. It is however worth noting that for applications where saltwater is present, that the 5XXX series grades (such as 5754, 5083 & 5251) perform better. 6082 T6 aluminium is good for welding, brazing & soldering. 6082T6 is a very good grade of aluminium for machining. It chips nicely when being machined, and it is by far the most common grade of aluminium used in engineering workshops and machine shops in the UK today. It is also good for milling, turning, drilling & tapping. Most literature available online will simply tell you that grade 6082T6 is “good” for cold working & forming – a statement that we don’t necessarily agree with! Ask any aluminium producer or mill and they will tell you, without any degree of uncertainty, that grade 6082T6 is not designed for bending or cold forming. When asked, we also tend to advise that grade 6082T6 is unsuitable for folding. However, this doesn’t mean that grade 6082T6 can’t be bent, it just means that the fabricator needs to be prepared that it may not work and that the material may end up failing. For example; If a piece of 6082T6 aluminium was placed into a folder or press brake which was then set to achieve a 90 degree bend, there would be a chance that the aluminium would crack & open up along the fold, and eventually as the material is further stretched, it would break off. Where possible avoiding 90 degree + folds. Folding across the direction of the grain rather than along it. Grade 6082T6 Aluminium is suitable for protective anodising, hard anodising and colour anodising. 6082T6 is unsuitable for clear anodising. Grade 6082T6 is suitable for polishing. Grade 6082T6 aluminium is suitable for powder coating. Grade 6063 is a medium strength alloy and is the most common grade of aluminium for extruding. Its composition makes it perfect for extruding very small, thin walled and intricate shapes. 6063 Aluminium also has an excellent surface finish, making it ideal for architectural applications. As far as commercial aluminium sections go, T6 is the most common temper available. Aluminium Flat Bars, Aluminium Angles, Aluminium Mouldings & Nosings, Aluminium Tubes & Box Section. 6063T6 aluminium has good corrosion resistance. It is suitable for outdoor applications, and it will not rust. It is however worth noting that for applications where saltwater is present, that the 5000 series grades (such as 5754, 5083 & 5251) perform better. 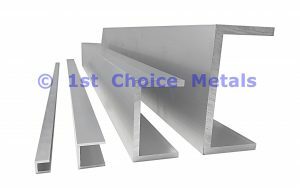 Grade 6063 T6 Aluminium is excellent for welding. It is also excellent for brazing and is good for soldering. Grade 6063 T6 aluminium has average machinability properties. Grade 6063 Aluminium has average to good cold working properties. When supplied in T4 temper bending and folding is never an issue. However, 6063T4 is far less common than the harder 6063T6. Whilst not a guaranteed bending grade, and as such the user must be prepared for possible material failure, grade 6063T6 aluminium will usually bend without issue – aluminium tubes and flat bars in grade 6063T6 are routinely bent, formed and folded by fabrication companies all over the UK. Grade 6063T6 Aluminium is very good for protective and colour anodising. It is excellent for hard anodising and is also very good for bright anodising. Grade 6061 aluminium is a medium strength aluminium alloy that is predominantly produced for the American market. Grade 6082 is the nearest equivalent grade that is readily available in the UK. In fact, differences between grade 6061 and 6082 are very slight indeed – they have over 99% of their composition in common, and therefore in the vast majority of cases grades 6061T6 & 6082T6 are fully interchangeable. Aluminium grade 6082 is slightly harder than 6061, but grade 6082 is also slightly more brittle. 6061T6 aluminium has good corrosion resistance. It is suitable for outdoor applications, and it will not rust. It is however worth noting that for applications where saltwater is present, that the 5XXX series grades (such as 5754, 5083 & 5251) perform better. 6061 T6 aluminium is good for welding, brazing & soldering. 6061T6 is a very good grade of aluminium for machining. It is also good for milling, turning, drilling & tapping. Most literature available online will simply tell you that grade 6061T6 is “good” for cold working & forming – a statement that we don’t necessarily agree with! Ask any aluminium producer or mill and they will tell you, without any degree of uncertainty, that grade 6061T6 is not designed for bending or cold forming. When asked, we also tend to advise that grade 6061T6 is unsuitable for folding. However, this doesn’t mean that grade 6061T6 can’t be bent, it just means that the fabricator needs to be prepared that it may not work and that the material may end up failing. For example; If a piece of 6061T6 aluminium was placed into a folder or press brake which was then set to achieve a 90 degree bend, there would be a chance that the aluminium would crack & open up along the fold, and eventually as the material is further stretched, it would break off. Where possible avoiding 90 + degree folds. Folding across the grain rather than along it. Grade 6061T6 Aluminium is suitable for protective anodising, hard anodising and colour anodising. 6061T6 is unsuitable for clear anodising. Grade 6061T6 is suitable for polishing. Grade 6061T6 aluminium is suitable for powder coating.